Sorry to have to throw cold water on all this optimisim. In fact, few things will work against the interests of potential converts as opening the doors to private providers. Going “out of network” raises the price for medical care. In the case of conversion, the price will be paid in the suffering of the offspring of converts a generation later. Readers have by now thoroughly familiarized themselves with Rabbi Dov Fischer’s excellent treatment of the subject. They realize that someone in Israel cynically calculated that the ignorance of the public would allow him to use the Ivanka Trump connection to strike a body blow at the Rabbanut. They now understand that Ms. Trump converted through a “network” beis din – a GPS court in Manhattan. Its validity was therefore never in doubt. The conversion that was questioned by the Petach Tikvah rabbinate was an “out of network” conversion. We don’t know why R. Lookstein treated this candidate differently than the ones (like Ivanka’s) that he referred to the GPS beis din. Neither, apparently, did the Petach Tikvah beis din. Their hesitancy to accept any private conversion was well-founded, and not directed at Rabbi Lookstein personally. National supervision addressed two problems: corruption and maverick standards. The first was a function of how people were paid. A mashgiach paid by the company he supervised often had a hard time removing his name from an establishment when he found a problem, since it meant that he wouldn’t be bringing home a salary that week. One of the signal accomplishments of the OU was placing an organizational buffer between client and mashgiach. A rabbinic supervisor can blow the whistle on an establishment without fear of reprisal. This alone is a huge advantage in keeping things honest. The second problem relates to the ability of people to find novel approaches to the arcane details of halacha. These individualistic interpretations were sometimes the product of ingenious creativity, and sometimes an outgrowth of rank ignorance and incompetence. In both cases, consumers who would not rely on similar arguments in their own kitchens were ill-served by such reasoning. Community-wide vaadim and national organizations ensured that standards were seen as defensible by a larger consensus. The maverick standards problem was even more common. For decades, no one reined in rabbis who simply were sloppy or didn’t care about securing evidence of intent to keep mitzvos, which the vast majority of talmidei chachamim feel is a sine qua non of conversion. After decades of sub-par conversions in the US, the Rabbanut in Israel finally stirred itself into action. (It might be that they did so peremptorily and clumsily, but that goes beyond the scope of this essay.) They moved antipodally from their earlier position, and challenged all US conversion, other than that of people they felt they knew well. The creation of the GPS system meant the creation of agreed-upon standards and protocols that satisfied the Rabbanut, and were livable to all the Modern Orthodox batei din. The only ones who were not happy were the sole providers. Some were unhappy for very legitimate reasons, because there was absolutely nothing wrong with their practices. Others had less noble reasons to complain. While kashrus can remain a matter of personal choice, conversion by definition can not. A convert wants to know that he/she will be fully accepted in a different city or country. Claiming that we should all learn to get along with each other’s standards is naïve and tilting at windmills. The word is out on the “street” that much Orthodox giyur in the past – and increasingly in the present – was problematic. Many, many have gone too far in their questioning. But no one has a quick fix for that. The bottom line is that people don’t relish the prospect of their future daughter-in-law’s Jewishness being questioned. The children of converts of thirty years ago are running, not walking, to more “accepted” batei din for what they see as an upgrade – a so-called giyur le-chumrah that removes any cloud of suspicion. The beis din which I serve has a general policy not to perform such conversions, except when explicitly requested by a community rav. If we were to abandon this policy and do giyur le-chumrah as a sideline under a different name, we could easily enrich ourselves. We don’t, because every such conversion is, to a certain extent, a casting of aspersions on a rav who is no longer alive to defend his standards or decisions. That does not quiet the malaise of large numbers of people who wonder whether their mother’s conversion was really valid according to the largest number of halachic figures. Telling them not to worry doesn’t work. They do have legitimate concerns. Sometimes, those concerns can be dealt with through thorough research. Sometimes they cannot. Had a GPS system been available decades ago, much suffering would have been avoided. Yes, there are problems with institutionalized systems. I contend that they are less severe, and less prevalent. For decades, all of us in the Orthodox world railed against Conservative rabbis who converted people and told them that their conversions were every bit as acceptable as Orthodox ones. They lied, and those conversions were roundly rejected, so often producing heartache and suffering in the next generation. Ironically, some of us now invite the same tragedy by insisting that every rabbi has the right to determine his own policies and convert whom he wants. This leads to nothing less than chaos. There are good doctors and bad doctors. Anyone who blindly accepts any medical degree as valid takes his life into his own hands. Rabbis are no different. In a perfect world, there would be time to examine the bona fides of every converting rabbi. But the world is not perfect. Rumors will spread – usually by well-meaning, rather than vicious, people – about “problem” rabbis with atypical standards. Their geirim will run into problems. Community-wide conversion courts eliminate those problems. Moreover, to pretend that all halachic positions are created equal is illusory. They aren’t. And like it or not, the Modern Orthodox community has shrunk to somewhere between one-quarter to one-third of the total Orthodox population. You can differ with the haredi world, but you cannot discount its effect on halachic decision-making. The halacha of the future will tilt right. Definitely not true. When they clamped down, they questioned (and often went further than that) people in the haredi world as well. There was no shortage of those who had, shall we say, less than stellar reputations. I know of cases where the Rabbanut found gittin of some rabbanim so sloppy that they figured out that the head honcho was just a garden-variety kal, and therefore stop accepting their giyur as well. 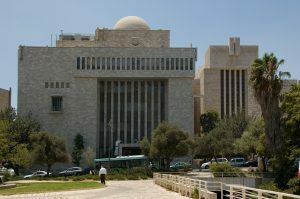 Then analogy to kashrut seems unnecessary and misleading–kashrut is nowhere near as important as gerut, and we (the unsophisticated and godless) may rely on individual rabbis for kashrut for all kinds of reasons which we wouldn’t want for something as important as gerut (and for Israelis with the citizenship that comes with it). Thus, I thought that the lady who was converted by him year ago was converted pre-GPS. Not post-GPS and outside the system. Which is very strange since R’ Lookstein uses GPS (as he did with Ivanka). So which is correct? There is a lack of information from the parties involved (the woman in question, RHL, and the Israeli rabbinic court in question), so we cannot answer such questions as to when and how she was converted who may or may not have suggested GPS route, why the conversion was not accepted bedieved by the court, etc. . And this is as it should be, out of respect for and sensitivity to the parties involved, in keeping with halacha. Only those ignorant of halacha or those trying to use the woman’s conversion as a political cudgel would make non-sequitur statements to the media like “Lookstein’s conversions were declared valid” (only a beis din performs conversion, not an individual rabbi) or “Rabbi Lookstein was passuled” (which no authority ever declared). All we know is that the court offered a choice of either investigation of the conversion like any non-GPS conversion (which would have not concluded until after her scheduled wedding date) or giyur l’chumra to expedite permission to marry. That the court is bureaucratically slow and poorly poorly represented by the media is a separate matter. Protect their interests from whom, exactly? From unscrupulous practitioners, to be sure. But also from the suspicious or intolerant who reject the conversions, gittin, or hashgacha of anyone they happen not to fancy–the rightward tilt R. Adlerstein mentions. Whatever happened to chezkas kashrus? The Supreme Rabbinical Court reject R. Lookstein’s conversions, GPS or not, because he’s not “on their list.” Well, if they don’t know him, let them investigate him. If they do know him, how do they come to regard his fidelity to Torah so lacking that he cannot be trusted? Is the rightward tilt leading toward, or away from, normative halacha? If the latter, should we resign ourselves to the pragmatic course R. Adlerstein describes, or should we fight back? Rabbi Adlerstein, you are ignoring Israel when you draw this conclusion. Most of the population in Israel, including most of the religious/tradition population, simply doesn’t care what the charedim do or say in terms of halakhah. And now more than ever before that includes the area of marriage and conversion. And it also includes talmidei hakhamim. We live in an integrated world, with Israel ever more at the center of the Jewish world, and its influence on diaspora modern Orthdodoxy will only increase. The halakhah of the future will tilt towards whatever is appropriate and realistic pesak for the mainstream inhabitants of Israel. Of course I’m ignoring Israel. The current controversy is in regard to conversion standards practiced in the US. Can’t help but respond to your remark about haredim in Israel, although it has nothing to do with my piece. As far as Israel, what “most of the population in Israel, including most of the religious/tradition population,” is just as irrelevant. No authentic Orthodox community can survive without top-notch Torah leadership. It is what that leadership respects that will be dispositive. Top-echelon talmidei chachamim in the Dati-Leumi community have never been dismissive of those at the top of the haredi halacha pyramid. Even as the DL world BH produces more and finer talmidei chachamim of their own (as they have been doing for some time), it is very doubtful that they will dismiss those whose learning they will respect. An interesting assumption that what will be the final practice follows what gedolim wish-really? How did Simchas Torah develop leining at night? Multiple Aliot? Are there gedolim happy with the very quickie IDF conversions? Probably, could use a long discussion of Halacha/practice developing both top up and bottom down.